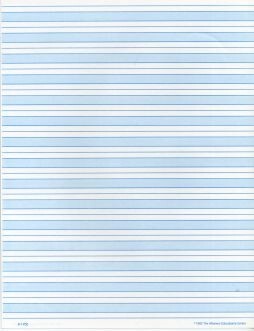 The blue shaded and ruled paper is for PRINT WRITING. It is particularly suitable for primary and early elementary students. Print writing helps develop good control of the hand in younger children (ages 4-7) without the need to learn complicated flowing movements, which are required for learning cursive. Print writing also better associates the shapes of the letters the child writes to the printed material the child learns to read, such as early reading books. Ideally, children are taught to form the alphabet letters in print on an individual chalk board, before they are given this paper to write on. The simplification of print writing eliminates discuragement and frustration in younger students in their attempt to achieve writing perfection.The shaded area indicates where the main body of each letter is to be placed. This paper is sold in reams of 500.